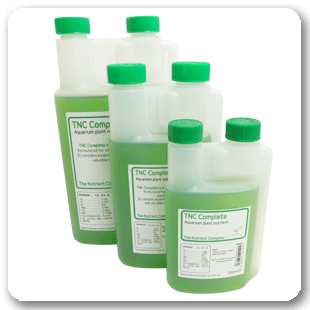 TNC Complete is an aquatic plant food specially formulated for use in more densely planted aquariums, or for aquariums with few fish. TNC Complete contains a balanced blend of Nitrogen, Phosphorous and Potassium as well as Magnesium and all the important trace elements. Encourages vigorous growth for strong healthy plants which in turn will greatly reduce the risk of algae. Can be tailored for use when Estimative Index (E.I) dosing. 1ml per 10 litre of tank water per week. Dose can be increased to 2 or 3 times per week depending on plant growth, water changes etc. 1.5% N, 0.2%P, 5% K, 0.8% Mg, 0.08% Fe, 0.018% Mn, 0.002% Cu, 0.01% B, 0.01% Zn, 0.001% Mo, EDTA.